What Do You Mean By Cardiopulmonary Resuscitation? Do you ever wonder ‘What is exactly cardiopulmonary resuscitation’? Anyway, it’s quite common question for those who’re not familiar with the techniques of CPR. The abbreviation of CPR is ‘Cardiopulmonary Resuscitation’ that is a term referring to the survival of a person through the heart and lungs. 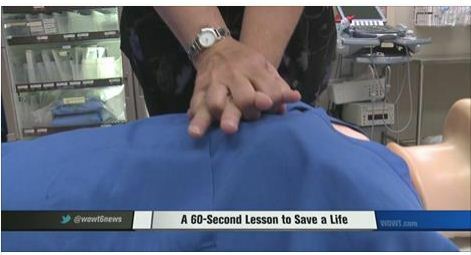 The basic technique used to perform CPR includes chest compression and retention of breathing process to keep the victim’s brain alive and also restore the normal heart rhythm. In short and simple term, cardiopulmonary resuscitation is a direct response to sudden cardiac arrest that’s when a victim’s heart stops beating due to several reasons. However, heart failure seems as the main problem in this circumstance; but the act of CPR more concerns brain than the heart. While other organs of the body can survive a little while without heart beat, but the brain dies within seven minutes for not receiving oxygenated blood. Hence, death of brain can be one of the most catastrophic of organ failures because of losing brain functionality. That’s the main reason why rescuers or bystanders need to perform CPR in order to retain blood circulation process and flow of blood to the brain even after the brain function is stopped. 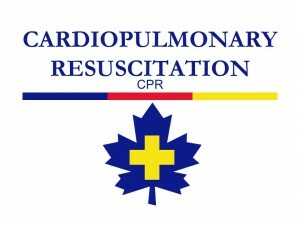 What Does the Process of Cardiopulmonary Resuscitation Include? The whole process of CPR includes chest compression phase that involves gently pushing the chest downward in a rapid way in order to continue the blood movement throughout the body of the victim and rescue the breaths by making sure the blood is being oxygenated. As soon as the brain is able to receive sufficient oxygenated blood supply, it will be ready to function without any injury. However, it’s quite obvious that CPR can’t perfect the heartbeat rate, that’s why survival rate of cardiac arrest victims depends on how quickly a normal heartbeat is restored usually with the help of AED or Automatic External Defibrillator. 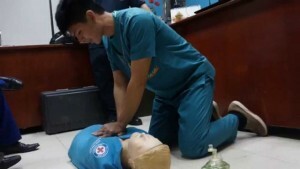 But remember one thing that cardiopulmonary resuscitation is a life saving process that everyone should be aware of how to perform the processes very well in case of cardiac emergency arises. Though for many people CPR is intimidating enough to imagine performing on a stranger. However, statistics explain that most of the time CPR is applied to save the life of loved one, friend or family. Conclusion – If you’re interested in learning the basics and thorough details on Cardiopulmonary Resuscitation, then it’s highly recommended to enroll into CPR online certification courses. To become CPR certified, you should join CPR training online at CPR Professor and know how easy it can be to help save more likes. Our online CPR certification programs strictly follow the latest national and international guidelines for CPR, AED and first aid techniques, including the compression-only standards. Upon completion of our innovative CPR training courses, you’ll receive a nationally recognized certificate issued by the American Safety Training Institute; which is valid for two full years. Rest assured that our first aid certification courses can offer you with necessary skills and knowledge you need to respond to the life threatening situation like sudden cardiac arrest with speed and confidence. Feel free to contact us today, if you have more queries on Cardiopulmonary Resuscitation. For more news and notifications on CPR certification courses, stay connected with us on Facebook, Twitter and Google+! When you find someone having a cardiac arrest suddenly, keep in mind that their heart stops completely. As a result, they collapse, lose consciousness and stop breathing. It’s quite essential to act at a quick pace. After all, this is what you should do! Taking CPR training can benefit a cardiac arrest patient instantly. In particular, CPR training is something everyone can greatly benefit from getting and encouraging more number of people to obtain it too. Let’s take a glimpse at a few of the key reasons why you should enroll into a CPR training online class. 1. You Might Save Someone You Care – When you find someone collapsing suddenly and requiring CPR, you tend to see it happening to a stranger out in public. However, most cardiac arrests occur in the home- around 85%. That means if you ever find yourself in such situation, someone in need of CPR, it’s more likely to be your friend, or a loved one than a total stranger. Think about it and who won’t love the feeling of confidence that comes with knowing you can save your loved one’s life! 2. You’ll Get to Know How to Perform CPR Properly – Most of us have a pretty good idea of how to perform CPR even just from watching your favorite characters doing it on TV. Hence, it’s a much better idea to seek out online CPR training to perform on a cardiac arrest patient immediately. After all, training classes can increase the chances of performing the procedure in a better way, which in turn maximizes the chances of survival of patients. 3. Receiving Training is Convenient, Easy and Affordable – If you’ve hesitated to get CPR training earlier because you think it’s expensive or needs a huge time commitment, you should know that nothing is further from the truth. Even online CPR courses covering additional skills are reasonable enough to fit into the modest budgets. The courses are not time consuming at all and all you need to do is to enjoy learning CPR online in the comfort of your home. What’s more you want, as you don’t even need to sign up for an in-person course at a brick and mortar setting now-a-days! You can receive CPR training and certification online when you take your course with an accredited organization like CPR Professor. This Skill is Worth Your Time – Learning CPR is a basic skill. Now that you know CPR training can make such a major change in a person’s life, shouldn’t you take the time to learn cardiopulmonary resuscitation! When selecting a course, make sure you should enroll an online CPR training at CPR Professor. 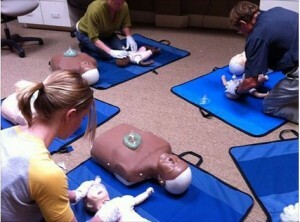 Our CPR classes are designed for ease of access without compromising content. Hence, you should join in to CPR training online and discover its benefits on your own! Don’t forget to share your experiences and thoughts in the comment section below! Cardiac arrest is nothing but the ultimate 911 emergency. During this period of time, the heart stops the blood circulation inside the body and brain, either by beating so fast or stopping the heart beat altogether. In fact, without abundant oxygen supply, the brain cells start to die! Death occurs in minutes, unless the bystanders take the matters into their hands and start Cardio Pulmonary Resuscitation (CPR). Doing CPR immediately can make the blood circulate at a steady pace, until the professionally trained and better-equipped responders arrive on the scene to keep the heart back into a stable rhythm. Starts the CPR process immediately and continues doing it until another person can use an automated external defibrillator (AED)to shock the heart back to the normal rhythm. AEDs arenothing but the portable devicesthat offers a quick electrical shock to the heart to get it restored to a normal rythm. They’re commonly available in public places like shopping malls. Unluckily, they are often left unused in their cabinets, when if there’s a real emergency. But the overall message for the people is that when they find a patient suffering from a cardiac arrest on the street should recognize and respond to it quickly to save lives. If you are ready to help someone who is having a cardiac arrest, then you should watch out two words like ‘recognize’ and ‘respond’. Many people don’t have any idea on cardiac arrest, a heart attack or any fainting spell. A person in cardiac arrest doesn’t breathe, doesn’t have a pulse and can’t respond to you. But someone having a heart attack is usually conscious, breathing and has a pulse as well as can answer your questions. Contact 911 right away or have someone else do it. Making a call to 911 means emergency medical responders are on their way to reach you. Start chest compressions with your hands only. Keep your hand over the other and place them on the breastbone of person, in the middle part of his or her chest. Relax and repeat the process. Do this for 100 times in a minute. Keep doing the CPR until someone arrives with an AED, either a bystander who has got it from the nearby business or building or a first responder. Remember, mouth-to-mouth breathing isn’t necessary if you are doing CPR on a person in cardiac arrest. That’s due to the fact that the blood of the individual has enough amount of stored oxygen in order to keep him or her going for a while. Many organizations offer CPR, AED and BLS training programs. The notable one among them is CPR Processor. As a reputable resource, it has been providing quality educational practices through online. So you should make a small investment of time and effort to learn CPR with CPR certification courses of CPR Processor. No doubt, their CPR online courses can offer a huge potential payoff by saving a precious life. So make your CPR certification online and respond to a life-threatening at a quick pace and confidence. Medicine and medical technology are constantly improving and making advancements in the world of healthcare. As new information is gathered and understood, changes to practices and standards are updated to ensure the highest quality of care is available. This is true for Cardio Pulmonary Resuscitation (CPR) and Emergency Cardiovascular Care (EEC) as well. The latest guidelines for CPR EEC have just come out from the ILCOR for 2015, the newest guidelines since 2010. CPR guidelines and procedures are updated as needed. Every 5 years major updates are released as more studies and scientific evidence is evaluated. The new guidelines for 2015 deal with everyone from bystanders to hospital staff. The professionals suggest that bystanders understand when to call emergency services and to give their location. Then, they should put their mobile phones on speaker so they can hear dispatcher instructions while checking for breathing and performing chest compressions of 100-120 times per minute. For those who may be trained in on-site or online CPR, they should do a 30:2 ratio of compressions to breaths. Dispatchers need to be alert to anyone having generalized, brief seizures, which can be an indicator of cardiac arrest. Dispatchers also need to be able to help bystanders by walking them through checking for breathing and the steps of CPR until help arrives. Another recommendation is that mobile dispatch systems be put in place in communities to improve survival rates. These systems notify rescuers of any potential cardiac arrest issues, giving those in cardiac arrest a better chance of getting chest compressions faster. On average, 200,000 cardiac arrests happen each year in hospitals alone. To address this issue, the new guidelines suggest integrated systems that include quality improvement and a set framework for resuscitation systems from the community level to the healthcare level. The guidelines also suggest that in addition to 100-120 compressions per minute, that the compressions go to a depth of 2 inches minimum, but avoid going more than 2.4 inches deep. Managing temperatures can also help avoid brain degradation in patients post-cardiac arrest. Temperatures between 32-36o C need to be maintained for a minimum of 24 hours. Other guidelines encourage healthcare providers to perform checking for breathing and taking the pulse at the same time so they can begin first chest compressions sooner. For infants, guidelines have been changed to getting oxygen to an infant quicker by starting CPR when they are under a radiant warmer, instead of intubating them as was suggested prior to these new guidelines. As these updated guidelines are implemented, the International Liaison Committee on Resuscitation will determine whether they are improving the chances for saving more lives. As further research comes in, they will again review the standards and make necessary adjustments, continually improving the guidelines to ensure more lives are saved every year. To get a full look at the New 2015 CPR guidelines please sign up for one of our online cpr safety training courses today. CPR training saves lives! CPR Professor certifications are issued through the American Safety Training Institute. American Safety Training Institute certifications are recognized worldwide and follow national guidelines for CPR and First Aid training. We eliminate any doubts you might have by offering a 100% money back guarantee*. If your certification card is not accepted we will issue a full refund. * Please review the TOS for full refund directions. ©2019 CPR Professor. All Rights Reserved.